Taskix is a shareware program designed for users who often work on their PC with multiple windows open at one time. It is generally used to reorder tabs on your taskbar with a simple drag-and-drop. It is a very useful windows customization utility and can also close tabs with a middle-click. As a small and compact program, the memory and cpu footprint is not even noticable, meaning Taskix is a lightweight and robust. Robust IT also offers a 64-bit version. Taskix is basically a freeware/donateware application as the program runs basically unlimited, but the author does ask for donations if you find the program useful; you will be given a free registration code when the donation has been received. The program currently does not run on Windows 7. Taskix is licensed as freeware for the Windows (32-bit and 64-bit) operating system / platform from windows customization software without restrictions. 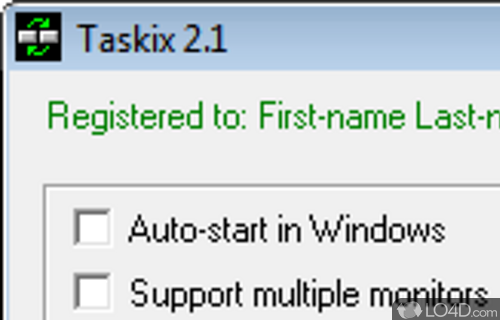 Taskix 2.1 is available to all software users as a free download (Freeware). Compatibility with this button reorder software may vary, but will generally run fine under Microsoft Windows 10, 8, 8.1, 7, Vista and XP on either a 32-bit or 64-bit setup. A separate x64 version of Taskix may be available from Robust IT. This download is distributed as Taskix32_2.1.msi and Taskix64_2.1.msi. We have tested Taskix 2.1 against malware with several different programs. We certify that this program is clean of viruses, malware and trojans.